Happy Monday...errr, I mean WEDNESDAY! It feels like Monday to me, though. I just got back from vacation! I spent 5 amazing days "off the grid" fishing in Northwoods Wisconsin. I love the simplicity of time spent in the boat without paying any attention to my cell phone. I am relaxed and rejuvenated. So - did you get your hands on the Eastern Palace bundle while I was gone? This bundle is a beauty - I can't get enough. Today I want to showcase this beautiful card my friend Connie made and am giving you step-by-step instructions to make it yourself. Isn't this card stunning? 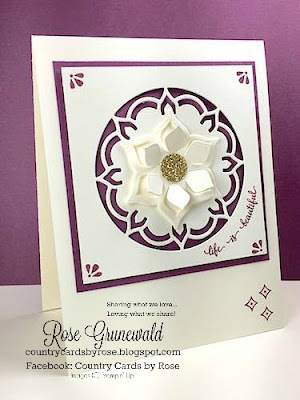 I absolutely love, love, love that Fresh Fig pop of color against the crisp Whisper White. Fresh Fig is one of our new in-colors, and I can't get enough! Ready to make this card? Gather your supplies! Adhere the Fresh Fig cardstock towards the top of the Vanilla card base. Die cut the medallion image from the center of the 3 ½” x 3 ½” Vanilla cardstock. Make sure you have a point facing the top. Stamp the (3) burst image in each corner and “life is beautiful” around the circle. Place (5) Dimensionals on the focal image and adhere onto the Fig cardstock. Die cut the (2) dies for the star image at the same time from the 2 ½” x 2 ½” Vanilla. Adhere the Gold Glimmer circle in the center. Place a Dimensional on the back and adhere to the center of the medallion. Stamp (3) diamonds on the bottom right corner. How easy was that?!? 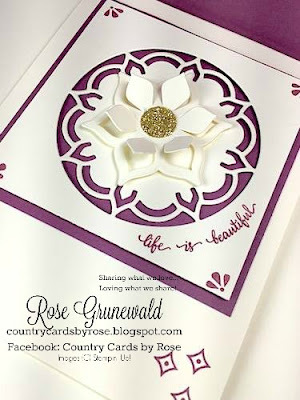 I just love stunning and simple card! Remember, if you buy the Eastern Palace bundle from me using my May hostess code KCGZKGBH, you will receive exclusive tutorials on 25 cards...yep, you read that right...25 cards (!!!) as my gift to you to think you for your business! You'll be able to sit down and get to crafting right away with tons of ideas!